Product prices and availability are accurate as of 2019-04-15 12:36:33 UTC and are subject to change. Any price and availability information displayed on http://www.amazon.com/ at the time of purchase will apply to the purchase of this product. 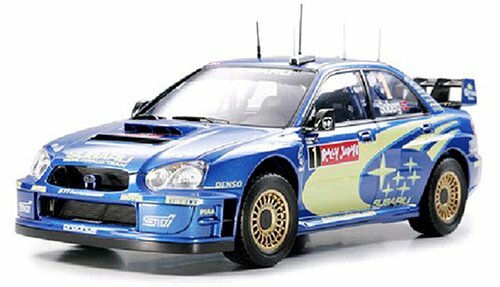 Model Cars is proud to list this #24276 Tamiya Subaru Impreza WRC 2004 Rally Japan 1/24 Scale Plastic Model Kit,Needs Assembly by Tamiya. Buy this realistic #24276 Tamiya Subaru Impreza WRC 2004 Rally Japan 1/24 Scale Plastic Model Kit,Needs Assembly made by Tamiya and featured by ModelCars.us. This interesting model is currently in stock - purchase securely and safely on modelcars today. About the 2004 Subaru ImprezaThe 2004 WRC season saw the first ever WRC event to be hosted in Japan, with Rally Japan held in Hokkaido in early September. It was no surprise that Japanese rally icon, the Subaru Impreza, had the majority of the crowd's support as it rushed to the lead from the outset. With Petter Solberg desperately needing a victory to stay in contention for his second consecutive drivers title, he didn't disappoint the crowd or the Subaru team, leading Rally Japan from start to finish to take his third victory of the season and move into second place in the drivers championship. In 2004, Solberg and the 4-cylinder 16 valve turbocharged Subaru Impreza have dominated the gravel tracks taking out victories in New Zealand, Greece, Japan and recently in Great Britain.About the Model * 1/24 scale assembly kit of the 2004 WRC Subaru Impreza as used in Rally Japan. * Suspension system, interior roll cage and dashboard reproduced in detail. * Under chassis has been raised to accurately represent vehicle as used on gravel surfaces. * Characteristic sectioned rear wing comes as one piece. * Transparent parts used for tail lights and head lights with metal plated reflectors. * Synthetic rubber used to accurately represent Pirelli gravel tread tires. * Includes markings for both Petter Solberg's No.1 and Mikko Hirvonens No.2 vehicles.